Debt ceiling negotiations: Has Obama already lost them? 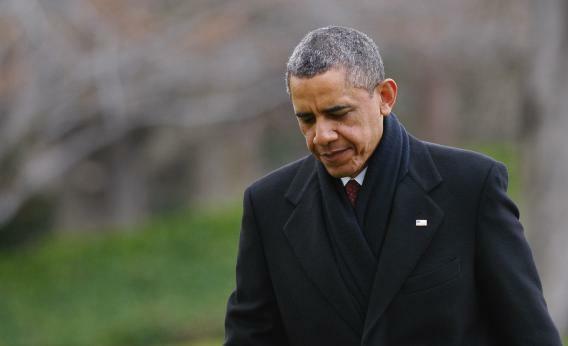 Has Obama Already Lost the Debt Ceiling Negotiations? President Obama returns to the White House on Dec. 27 in Washington, D.C., under pressure to forge a year-end deal with Republicans to avoid the tax hikes and spending cuts of the fiscal cliff. Didn’t we go through this debt ceiling travesty in 2011? And didn’t we swear that the White House would never again do a so-called mega-deal without resolving the debt ceiling as part of it? Here is what I wrote in a Slate column on July 25, 2011: “So why, as a condition for extending the Bush tax cuts … did he not require the Republicans to raise the debt ceiling?” Why are we seeing headlines stating that Senate Minority Leader Mitch McConnell has already rejected the idea of more taxes, and that the Republicans will only negotiate over cuts? Why are we back to square zero on our fiscal future? The Republicans have already accomplished most of what they wanted. Government spending as a percentage of GDP has been encumbered by permanent enactment of over 90 percent of the Bush tax cuts. They have long sought a government starved for revenues and a public focusing on the deficit, not the need for investment, and now they have them. It would have been better to have gone over the fiscal cliff, to have required that a debt ceiling increase be part of the deal, and to have negotiated with the new Congress than to do what the White House has to do now.